Modern oils are the product of over 100 years of scientific development. The advances made in oil technology have been driven by the lubrication requirements of increasingly sophisticated machinery, such as the automobile engine. Current fully-formulated engine oils, sometimes called PCEO (Passenger Car Engine Oil), are highly-complex products. The oil inside the fancy packaging is created by blending one or more groups of base stocks with many additives. Even lubrication engineers cannot entirely predict the exact performance of a base stock and additive blend without extensive experimentation. Considering this, the oil consuming public has little hope of understanding the complex characteristics of these base stocks and additives. It is little wonder that many people buy oil based on packaging or brand name alone. Except for the premium true synthetic oils, most manufacturers are proprietary about the exact composition of their oil, and will not divulge its composition or base stock type. An elemental analysis will tell you very little about the oil itself, usually just the presence of elements in the additives, such as phosphorus, zinc, or boron from anti-wear compounds, or calcium from the detergent. stock, or one brand of oil over another. In most cases, both sides of the debate are equally uninformed as to the actual characteristics of the oils they advocate. In the absence of real information, some people will follow a specific brand in hopes past performance will predict future performance. Others may be attracted to snake-oil additives in the belief there can be a special ingredient that unlocks superior performance from an existing oil. The best way to make an appropriate choice in an oil is to understand the factors that determine oil performance, and apply them to a specific engine. When we discuss oil performance or characteristics, we are almost always referring to fully-formulated PCEO. Fully understanding why one PCEO performs differently from another requires a look underneath the retail formulation into the base stock and additive characteristics. The characteristics of the base oil stocks can be drastically altered by the additive package and can often either mask or correct deficiencies in the base stock. More often the additive cannot entirely address the shortcomings of the base stock. And, if oil made from one specific base stock is good enough, why pay more for an oil made from a more expensive one? In this Tech Brief, we discuss the base stock contribution to performance. Let’s look first at the oil development timeline, and then examine some facts about base oil stocks. 1859 The world’s first successful oil well 69 feet 6 inches deep was dug in Titusville, PA.
1866 The vacuum process for refining oil was patented. Typical VI for this original naphthenic stock was less than 80, and the oil was subject to severe degradation under heating, as the lighter aromatic fractions evaporated. Many of these oils were also unusable in winter due to the high percentage of heavy waxes which would solidify at low temperatures. 1911 SAE developed an oil classification system organized by viscosity. 1919 The API was formed to standardize specifications for petroleum products. 1921 The first petrochemical product was synthesized – isopropyl alcohol. 1920s In the 1920’s and 1930’s, synthetic hydrocarbon research was conducted in both the U.S.1 and Germany2. 1930s In the 1930s, a general shift was made from naphthenic base stocks to the more stable paraffinic stocks following the advent of solvent dewaxing. These new, mostly paraffinic base stocks featured an improved VI around 95. 1931 Standard Oil in the U.S. and I.G. Farben in Germany both discover polymerization of olefins to form liquid oils. 1936 The first catalytic oil cracking distillery was built in Paulsboro, NJ. 1940s The severe demands of turbine jet engines spurred research in synthetic base stocks. Initially utilizing diesters, the increasing temperatures and loading demanded the development of the more advanced hindered neopentyl or polyol esters. 1946 National Carbide Company Inc. marketed its first commercial PAG synthetic motor vehicle oil, Prestone Motor Oil, in two areas in the East during the winter of 19463. 1947 The API released the first set of specifications defining three classes of mineral automotive oils: Regular (straight mineral oil), Premium (oxidation inhibitors added), and Heavy Duty (oxidation inhibitors and detergent/dispersants added). These three oil types all shared a common Group I base oil stock. 1952 API & ASTM develop ESCS (Engine Service Classification System). API and ASTM revised ESCS in 1955 and again in 1960. ESCS separated gasoline engine oil performance into Service Categories ML, MM, and MS.
MS in vehicles between 1964 and 1968. 1971 Category SE motor oil standardized. 1972 AMSOILTM, Inc. introduces a diester-based PCEO, the first synthetic to be certified under the newly introduced API system. 1973 The MobilTM Co. was the first to introduce the now ubiquitous PAO/ester blend fully-synthetic API certified PCEO. 1977 AmsoilTM reformulates its product to the higher performance PAO/ester blend. 1979 Category SF motor oil standardized. 1988 Category SG motor oil standardized. 1993 Category SH motor oil standardized. 1996 Category SJ motor oil standardized. For the first time, a limit of 0.1% was placed on phosphorus in certain API classes of PCEO. 1999 The National Advertising Division of the Council of Better Business Bureaus decision in MobilTM vs. CastrolTM allows engine oils formulated with Group III hydroisomerized base oils to be advertised as “synthetic oils” along with the traditional Group IV PAO and a few Group V oils. 2001 Category SL motor oil standardized. base stocks exceeded that of the Group I base stock for the first time. 2004 Category SM motor oil standardized. Phosphorus was now limited to 0.08% maximum. Recognizing that ZDDP is necessary, a minimum of 0.06% was established in some API classes. 2007 ZDDPlusTM is developed to address the classic and high-performance engine’s need for ZDDP in greater amounts than is contained in API SM oil. 2008 Most high-quality oils sold into the American automotive oil industry are Group II and III base stock oils. The synthetic oil base stocks in total compromise less than 5% of all engine oils sold in the United States. Crude mineral oil is a soup of over 17,000 different compounds, both organic and inorganic.4 It also varies greatly in composition from one geographical region to another. The original mineral oils designed for automotive engine lubrication were thermally distilled straight-weight oils with no additives. Thermal fractional distillation is a process in which the crude oil is heated to the boiling point to vaporize its constituent molecules. This vapor is then cooled as it moves up the fractional distillation tower. The heaviest molecules condense low in the tower at the highest temperature, and the lightest, most volatile fractions condense farthest up in the tower at the lowest temperature. In this way, the complex mix of chemicals that is crude oil can be separated into different “distillate fractions” of decreasing condensation temperature. Modern base oils are processed after distillation in increasingly advanced ways to improve their characteristics. It is important to note that each separate condensate stream still contains a range of different molecules, which basically only share common temperatures of condensation. These different molecules in a single condensate stream may have greatly different lubricant and other properties from each other. The distillate fraction from which lubricating oils are made condense at greater than 400°C, and are usually further fractionated into differing weights in a separate distillation process. A major factor in the overall performance of an oil is the distribution of molecular weights it contains. With most oils, there is a correlation between molecular weight and viscosity. As oil is heated, the lighter fractions evaporate, increasing its viscosity and changing other characteristics. One of the reasons why PAO Group IV stocks have such predictable performance is that they consist of an extremely narrow range of different molecular weights. Group III+ VHVI (Very High Viscosity Index) oils have a much narrower range than standard Group I or II oils. 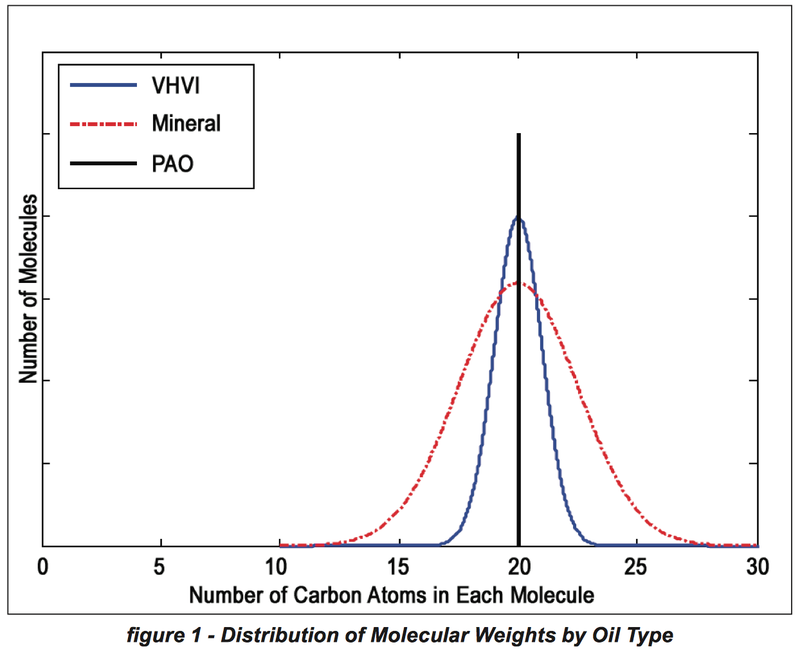 This is graphically represented in figure 1,5 which shows the average molecular weight of each oil type as expressed by the number of carbon atoms each of its molecules contain on the horizontal axis, and the statistical occurrence of those species on the vertical axis. In the production of lubricating oils, additional processes are used after distillation to remove sulfur and other minerals. The oil may also be solvent dewaxed to prevent thickening and solidification at low temperatures. In this process, the oil is mixed with solvent to lower the viscosity for processing, then chilled to precipitate the wax. The solvent is then removed, leaving oil with a lower pour point and higher VI (Viscosity Index). Most Group II and III oils are also “hydrofinished” to reduce contamination and aromatic content. The highest quality mineral oils are also “hydrocracked,” a process by which the molecules are subjected to extreme pressures and temperatures in a hydrogen atmosphere in the presence of a catalyst. This stabilizes reactive components and reshapes many molecules into more suitable forms. A related process used to make many high-quality Group III+ oils is “hydroisomerization,” a process which converts waxes to high-viscosity index oils. Group I base stocks are composed of fractionally distilled paraffinic mineral oil stock which is further refined with solvent extraction processes. This improves certain properties such as oxidation resistance and removes wax, which improves the VI. Group II base stock is composed of fractionally distilled paraffinic mineral oil stock that has been solvent dewaxed and hydrocracked to further refine and purify the oil. ShellTM Rotella® and PennzoilTM Purebase® are two examples of PCEO made from Group II base stocks. Similar characteristics to Group II base stocks, Group III base stocks have higher viscosity indexes. Some Group III base stocks with VHVI are sometimes referred to as Group III+. Group III base stocks are produced by a wide range of processes, such as further hydrocracking of Group II base stocks, or by chemically modifying slack wax, which is the end-product of the dewaxing process, which improves the VI. Some Group III+ oils are created by highly processing oil into what have been called “Severely Hydrocracked,” “Chemically Modified,” or “Semi-Synthetic.” CastrolTM Syntec® and ValvolineTM Durablend® are oils manufactured from Group III base stocks. This group is reserved for one type of synthetic oil made up of a class of molecules called PAOs (polyalphaolefins). Contrary to popular misconception, the molecules which make up PAO and many other synthetic oils originate in crude oil. In the case of PAOs, they are created by polymerizing olefin molecules obtained from the cracking of wax molecules. In many cases, these wax molecules are a by-product of mineral oil dewaxing processes. Fully-synthetic Mobil One® and AmsoilTM are two examples of oils made from a primarily PAO base with some Group V esters added to improve additive solvent and seal swelling performance. Group V is the catch-all group for any base stock not described by Groups I to IV. Examples of Group V base stocks include the old naphthenic base stocks, silicones, polyol esters, polymer esters, PAG (polyalkylene glycols), and PFPAE (perfluoropolyalkylethers), as well as others. Since there is nothing in common between most of the oils lumped together as Group V, it makes no sense to discuss them as a group. Instead, a few single types of synthetic oils in Group V will be discussed individually. The Group VI class is not yet recognized in the U.S. by the API. It was introduced in Europe by the ACEA (Association des Constructeurs Europeans D’Automobiles) for the synthetic PIO (polyinternalolefins) oil base stock. The properties described in this section are the major characteristics of oils which determine their suitability for a particular use. The relative properties of the different base stocks are summarized and compared in figure 5, and defined below. is reserved for one type of oil, PAO. It has many superior characteristics to be sure, but it is not necessarily better than Group III+ oil in all applications. Group V is a catch-all for anything that does not fit into the other four groups. This is the method in which a resulting chemical composition is arrived at from crude oil. Saturated molecules are more stable than equivalent weight aromatic hydrocarbon molecules. This is the API’s time-honored method of describing the major molecular makeup of these groups. New manufacturing techniques are being developed for Group III oils which are so different in chemical makeup and performance, they share little with traditional Group III oils. Some of these are being termed Group III+ oils. Commonly measured in cSt (centiStokes), viscosity is a measure of oil’s resistance to flow, and is perhaps the single most important factor determining oil film thickness under load. The fractions used for lubricating oils are chosen for their molecular weight and viscosity. This resistance to flow comes from the oil’s molecules mutual cohesion, and the process of applying force and moving the molecules apart is referred to as “shear.” The energy used to shear the oil molecules apart is dissipated as heat in the oil. Excessive shear can cause breakdown of the molecules in the viscosity modifiers as well as in the base stock. This breakdown results in oil losing viscosity and forming a thinner film. To get a feeling for the viscosity of some common substances and the effect of temperature on the viscosity, refer to figure 3 below. a high VI. Unfortunately, these viscosity modifiers are very long-chain molecules, and many will break down in high-shear or high-temperature conditions, such as close tolerance bearings running at high rpm. When the modifier decomposes, the viscosity of the oil will decrease toward its initial viscosity without the modifier. This is because the addition of these viscosity modifiers increases the viscosity at all temperatures relative to the base oil alone. Volatility is defined as the percentage of oil which evaporates during an ASTM D-5800 test at 150°C. This is one characteristic where many pure synthetics, especially Group IV PAO, have a large advantage. Since all distilled mineral oils are made from a range of molecular weights and volatilities, extended heating will vaporize the lightest of these, resulting in a viscosity increase. A pure synthetic is basically one type of molecule of a narrow range of molecular weights. Therefore, there is little to volatize as the temperature increases, until a very high temperature is reached; then the evaporation or breakdown point of the great majority of the molecules occurs. Polarity is the relative measure of the electrostatic attraction characteristic of the base oil. A polar molecule is not electrically symmetrical, so it will move or orient itself in response to an electric field or the presence of other polar materials. Conversely, non-polar molecules are relatively unaffected by the presence of other polar materials or electric fields. This is not to be confused with conductivity, where a material easily gains or loses electrons in response to an electric field. Oil which is polar can bond to metal and other polar molecules (such as water) more readily due to their polar characteristics. An oil which is highly polar can have a tendency to be more hygroscopic, and absorb moisture. Additives such as ZDDP or calcium sulfonate are also highly polar. Without a polar characteristic, oil has little ability to bond or adhere to surfaces, which means that under pressure from loading, it will be more easily displaced and potentially permit metal-to-metal contact. 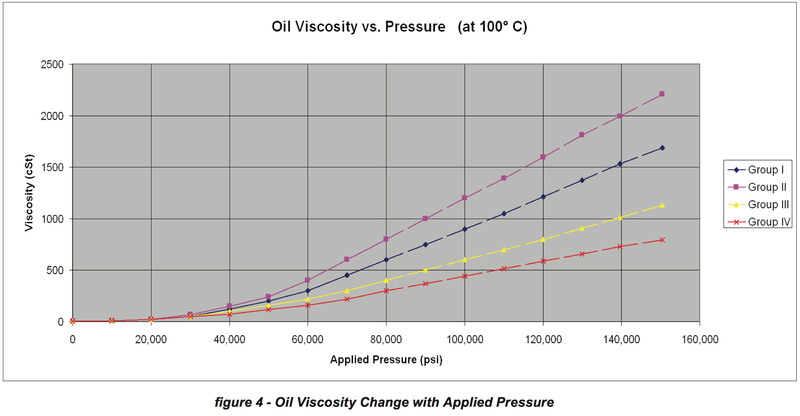 The factor of viscosity increase in response to pressure, as measured using AGMA 925-A03 test methodology, is abbreviated as ‘α.’ As graphically shown in figure 4, when subjected to extreme pressure, oil’s viscosity will increase as its molecules are forced into closer proximity to each other. Under extreme pressure, oil with a higher ‘α’ value will have a thicker film due to the resulting viscosity increase. This characteristic is exploited in the EHD (Elasto-HydroDynamic) lubrication mode (see ZPlusTM Tech Brief #11). The different base stock types have radically different average ‘α’ values, depicted in the figure 4,10 which plots actual measured values up to 80,000 psi. The values larger than 80,000 psi on the graph are straight-line extrapolations. The viscosity/pressure characteristic will depart from straight-line linearity at some critical pressure where the molecules are forced into close proximity to each other and entangle. After this point, the viscosity will rise rapidly with increasing pressure until the oil takes on the characteristics of a solid. Solvent capability refers to the relative ability of an oil to dissolve and retain common additive packages, such as ZDDP and detergents. Solvent characteristics are related to polarity, but also depend on chemical compatibility. Certain base oils, such as Group IV PAO, are poor solvents for additives due to their extreme chemical stability as well as low polarity. Pour point is defined as the ability of oil to flow at low temperatures. Using ASTM D-97, pour point is the lowest temperature at which the oil can be poured. The practical application of this parameter is, of course, engine operation in extreme cold weather. Low pour point synthetic oils were first developed for vehicles operating in Arctic climates. Referring to ASTM D-92, flash point is the lowest temperature at which a liquid or solid gives off enough vapor to form a flammable air-vapor mixture near its surface. This is related to volatility because flammable hydrocarbons must volatize and mix with oxygen in order to flash. Oils with fewer light aromatic hydrocarbon fractions will have a much higher flash point. EHD is the capability of oil to remain in a film under conditions of high pressure and shear. This property is related to mean molecular weight and structure of the molecule. Branched molecules show greater resistance to film rupture under high pressure than do linear molecules. In general, oils that show high EHD characteristics will also suffer from high shear under pressure and translation. This price index is a relative scale of base oil wholesale cost, as reflected in retail product price. The relative prices as stated in the chart are as of mid-2008. As synthetic oil production is increased, the relative price for these premium oils will come down. To a scientist, the word synthetic usually means man-made as opposed to occurring in nature. To a petroleum engineer in the 1980s, it referred to an oil whose molecules are assembled in a reaction from purified precursors in a synthesizing manufacturing method as opposed to an oil which was a processed fractional distillate. In other words, the molecules in the synthetic oil did NOT directly come from crude; they were manufactured by breaking down crude into purified single chemicals, then reassembling them. This is unlike the manufacturing method for Group I, II or older Group III base oil, which largely consists of molecules which can be found in the original crude. It is from this initial definition that the Group IV PAO oils, as well as some other Group V oils like esters, were initially labeled as synthetic. In the early 1990s, the lubrication industry attempted to get the API and SAE to clearly categorize differences between mineral and synthetic oils. Neither organization was able to do so, and as a result modified their documentation to remove any differentiation between the two. In 1999 the MobilTM Oil Corp. lodged a complaint against CastrolTM/ShellTM with the NAD (National Advertising Division of the Council of Better Business Bureaus). Mobil’sTM claims were that CastrolTM had changed the formulation of its “Syntec®” PCEO from a nearly 70% PAO Group IV base to 100% mineral oil Group III+ base, and yet still misleadingly advertised the oil as synthetic. (MobilTM itself had been marketing VHVI Group III based oils in Europe at that time and had advertised them as synthetic. )11 It also charged that CastrolTM had changed Syntec® to a “degraded” product to the detriment of the consumer, yet was advertising the oil as “superior” to all other motor oils, both synthetic and conventional. The NAD considered Mobil’sTM charges and decided on the first charge of false advertising, the definition of synthetic was not limited to Group IV PAO or Group V esters. They stated, through industry expert corroboration, the word synthetic could be used as a performance description as well as a method of manufacture. The definition of synthetic was the central issue to this claim, and the NAD cited as support how the two standards organizations, SAE and API, had changed their documentation to eliminate differentiating between mineral and synthetic oil. On the charge of “degraded” performance, the NAD found the 100% mineral-based Syntec® actually performed as well as, and in some ways better than the previous PAO-based formulation in a PCEO application, and dismissed that claim. With respect to the CastrolTM claim it provided “superior protection” to all other oils, the NAD found no support for the CastrolTM claim and ordered the claim to be removed from future advertising. We at ZPlusTM think the NAD decision did not deal with the main issue of defining the word synthetic, and chose to deal with the semantics of its use instead. A question one could pose is why CastrolTM needed to keep using the description of synthetic after making the formulation change. The answer seems rather obvious to us; the label of synthetic on an oil allows the manufacturer to charge a premium price for the contents, and CastrolTM did not want to lose the profitability of the Syntec® product. Therefore, we assume CastrolTM thought it worth the fight to have the word redefined for marketing purposes. not necessary. The fact they ceased to differentiate between conventional and synthetic base does not remove the substantial differences in characteristics between the two. This is not to say one is better than the other for all purposes, but they are not the same. A Group III+ oil may perform as well or better than a Group IV/V blend, but only in the context of certain PCEO uses. They do NOT become the same substances as a result of the NAD ruling, and in our opinion, should not be called the same in advertising. The problem with the NAD ruling is the meaning of the word synthetic in a PCEO advertising context is now potentially at odds with its meaning in a chemical context. In the search for higher profits, CastrolTM has managed to further confuse the customer and hide reality by obfuscating the advertising jargon. We agree that a modern Group III+ base oil in all of its fractionally distilled, severely hydrocracked, hydroisomerized, hydrofinished glory is not found in nature, but that does not mean it fits the original definition of synthesized. To carry the tenets of the NAD decision to their logical conclusions; a fractional distilled oil of any kind is never found in nature and, for some purposes, other Group II and III oils may perform adequately, as would PAO. Does that make them synthetic as well? And if, for instance, water happened to work as well or better as synthetic oil for cooling a machine part, does that make water in that context synthetic as well? We believe it would have been far more beneficial to all if CastrolTM had just proceeded to petition to create a new group for its new, unique high-quality oil. This would have allowed them to participate in the creation of standards by which an oil would qualify for inclusion in that group, and they would have the distinction of having the first oil to be considered for the group. This would be far more honest than attempting (successfully) to hitchhike the success of their product on the name synthetic, which had attained value due to the hard work of the chemists who had synthesized (by the original definition) PAO and other totally new molecules. Why not use language in an agreed-upon way to clarify, not obscure the truth? Like most people, when we want to know the meaning of a word, we go to a source that has been peer-reviewed more than any other: Webster’s Dictionary. When you look up the adjective synthetic in Webster’s, you will find the definition in figure 5. Perhaps the NAD decision was correct after all, if one uses the definition expressed in 4b and c.
In ZPlusTM Tech Brief #11, we will discuss how base stock characteristics affect lubricant performance in an IC engine. Share ZDDPlus News, Choose Your Platform!